If you have added someone to an organization by mistake, you will not want to leave the enrollment history for this person in that org. Click the person’s Member Type for that org and then click the red Drop button. 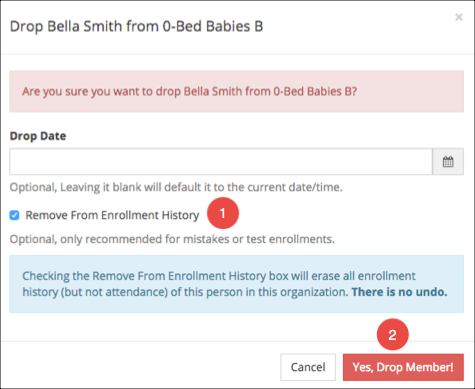 Check the box Remove From Enrollment History and then click the red Yes,Drop Member button. One reason you would not want a person to be a Previous Member would be for future communication. If you run a search to find everyone who has ever been enrolled in a particular org, this person would be included unless you remove the transactions, which would be the enrollment history.